There's not much to do here just yet, except stop by the Stone House. Battle a few trainers if you like and continue on to Mossdeep City. 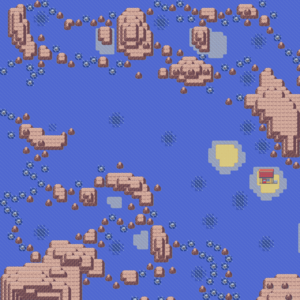 Relicanth is found underwater in Route 124 in Pokémon Ruby and Sapphire. Though it is a fish Pokémon, it cannot be caught with a fishing rod. It is slightly tough to catch; 2 or 3 Ultra Balls might get wasted, and Net Balls and Dive Balls do not work well.